Leaving the Wimbachgrieshütte follow the Wimbach Valley to a pass called Trischübelpass (1.764 m). This will take you about 1 ¼ hours. On the other side of the pass descend the debris slopes until you meet the “Oberlahnersteig”, a trail the you then follow to your right. From the parking, follow a forest road to the “Eckaualm” (1 ½ hours). 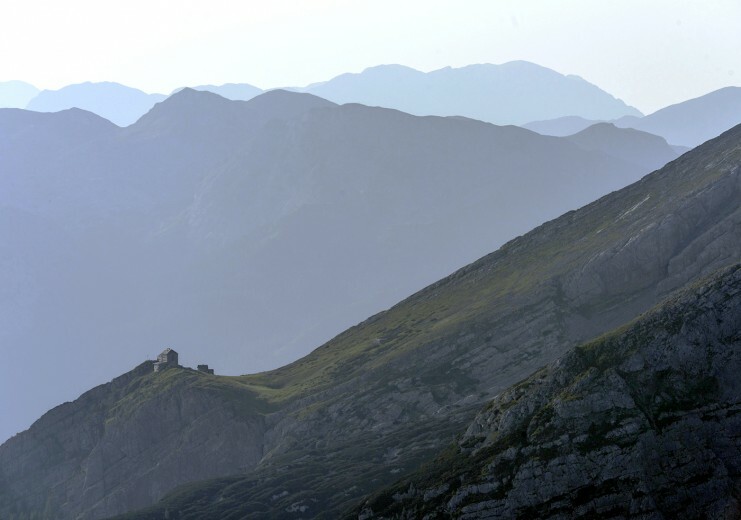 To reach the Hochalm, plan another 1 ½ hours on a simple trail. The descent to the Wimbachschloss (1 ½ hours) is steep and exposed. From the Wimbachschloss it is an easy hike along good trails and roads to the Wimbachbrücke. Follow the trail (Nr 2.) along the river to reach Ramsau. Follow the forest road until you reach the Eckaualm (1 ½ hours) and continue to the alpine meadows of the Hochalm at 1.500 m (1 ½ hours, no board or lodging). Follow the path to the right, which soon leads you the steep clearings of the Hochalm just below a debris cone. A steep rocky gully (partially euqipped with steel cables) leads to a large col, the “Eisbodenscharte” (2.049 m). Follow the broad and very scenic ridge to the south towards the Schärtenspitze. 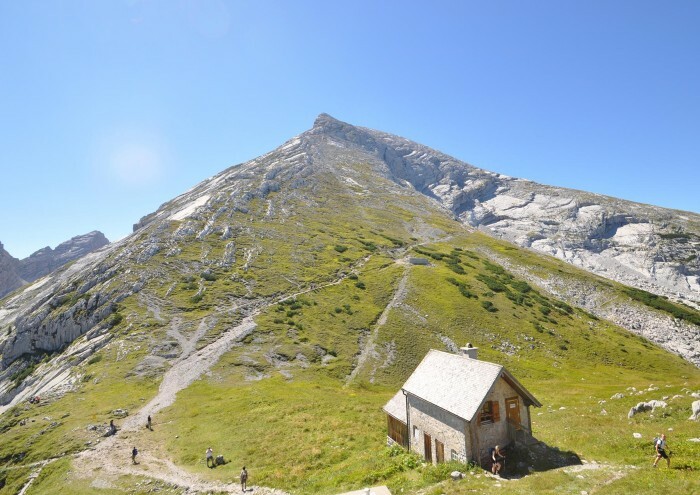 Soon you will meet up with a trail that would lead you straight down into the cirque and the alpine hut Blaueishütte. 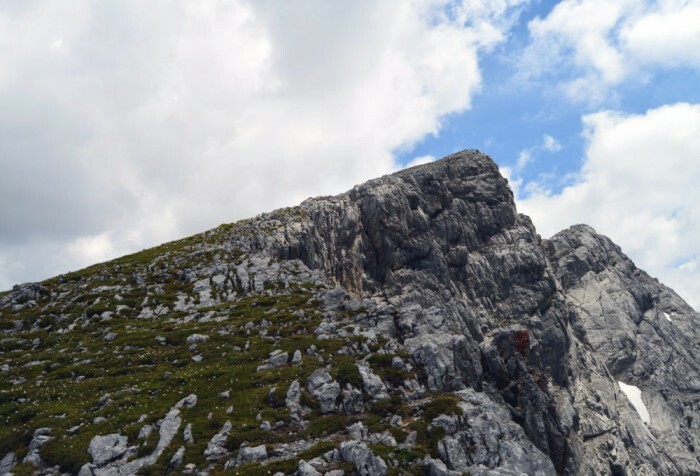 If you want to include the Schärtenspitze into your itinerary, turn right at this point and follow the ridge to the summit. The descent follows the trail down to the hut and along the forest road to the Hintersee lake. Follow the forest road, which lead you through a beautiful valley, through the alpine meadows of the Schapbachalm to the alpine hut “Kührointhütte”. 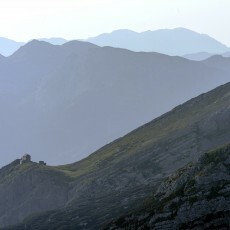 From the hut it is an easy walk to one of the most rewarding viewpoints of the region. 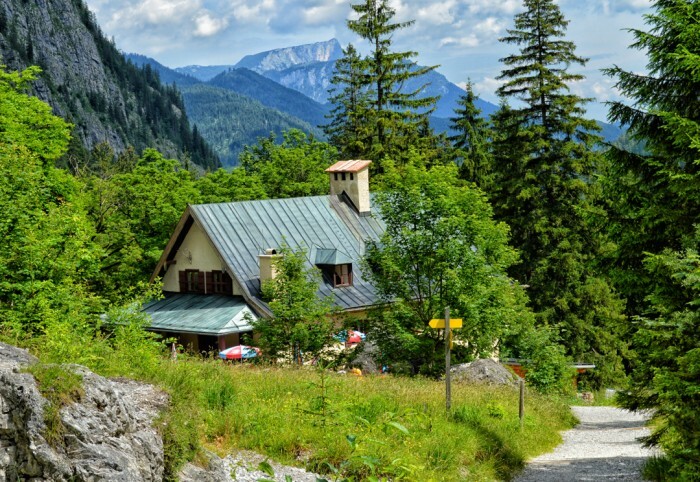 From the “Archenkanzel” you have a breathtaking view of the entire Lake Königssee far below. 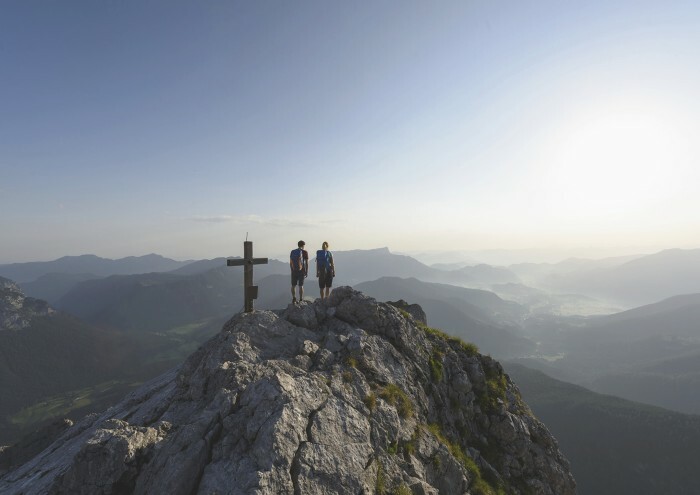 The descent takes you along the “Rinnkendlsteig” all the way to St. Bartholomä, a beautiful chapel at the shore of the Lake Königssee. 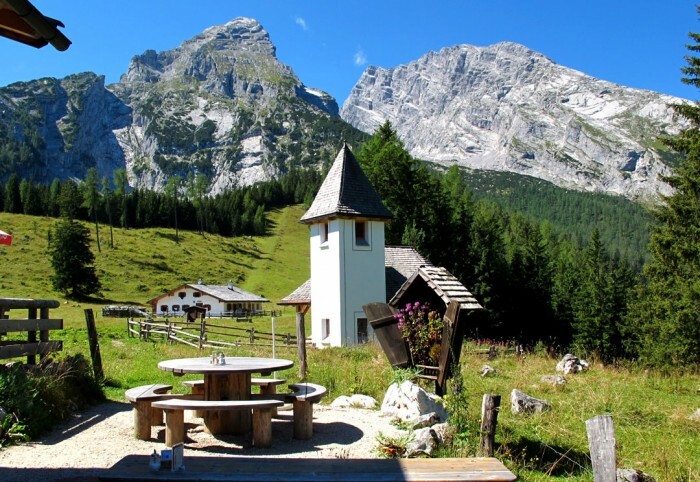 The main goal of the trip is to reach the shores of the Lake Königssee and the beautiful chapel of St. Barholomä. To get there it is a long, but simple, walk through the impressive alpine valley Wimbachtal until you reach the alpine hut Wimbachgrieshütte. From there you have to pass a difficult section (the so called “Sigeretsplatte”) and descent to St. Bartholomä. Another beatiful treat is jet to come: a scenic boat ride across the unique Lake Königssee. 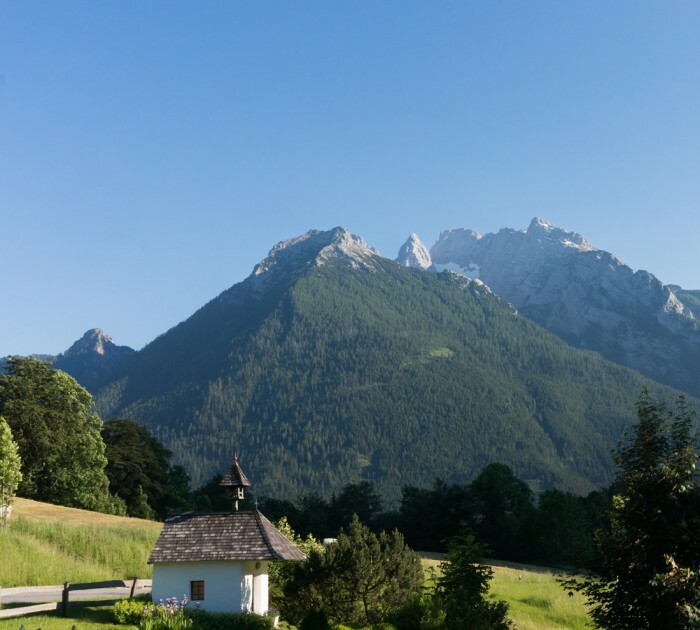 A public bus will take you via Berchtesgaden back to Ramsau. The trail Nr. 441 takes you past the alpine meadow of Stubenalm and Mitterkaseralm. Both farms are operated during the summer months and produce special cheese products. Another alpine meadow (the Falzalm) awaits the hiker until you reach the Watzmannhaus”:1759-1-Watzmannhaus.html at 1.930 m.
Easy scrambling will bring you to the top of the Watzmann-Hocheck (2.651 m). Total duration: 6 ½ Std. 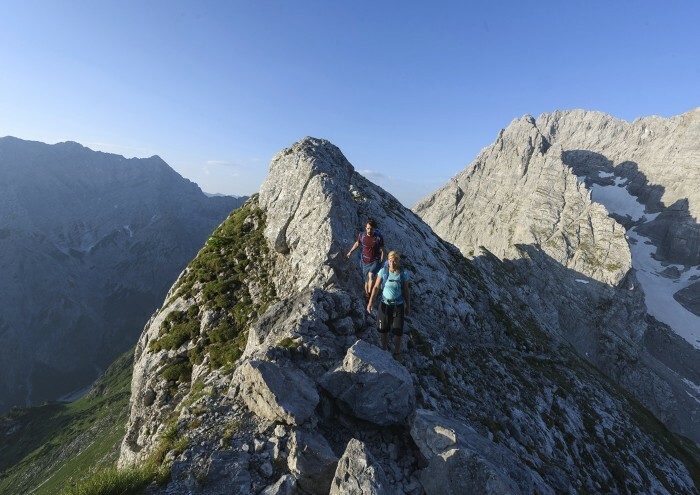 For those that are planning a larger and more challenging alpine trip, the Hocheck is just the starting point: the spectacular must-do traverse of the Watzmann. Find more detailed information about the traverse here. This long ridge traverse is a very special treat for the well trained and experienced mountaineer – like frosting on the cake and a cherry on top! The legendary ridge traverse starts at the public parking at “Wimbachbrücke”. 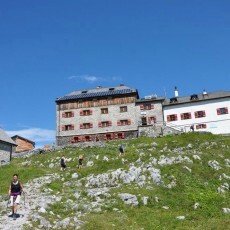 The first goal is the ascent on an easy hiking trail to the “Watzmannhaus”, a guarded and well maintained hut of the German Alpine Club. 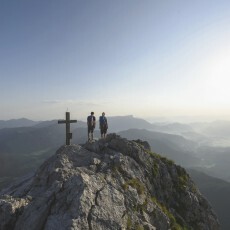 The ridge traverse starts at the Hocheck and continues to the “Central peak” and “Southern peak” of the Watzmann. The descent down into the Wimbach Valley is challenging and partly exposed, the rest of the descent is simple, but very long. Duration: 11 – 14 Std. 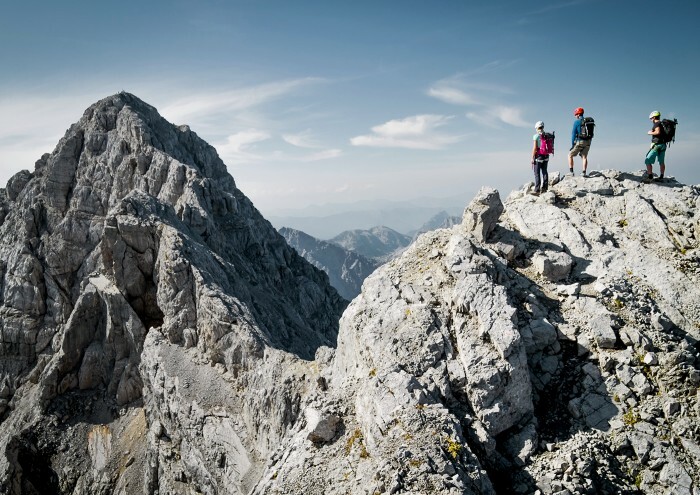 The ridge traverse is a serious and long, but highly rewarding alpine outing. 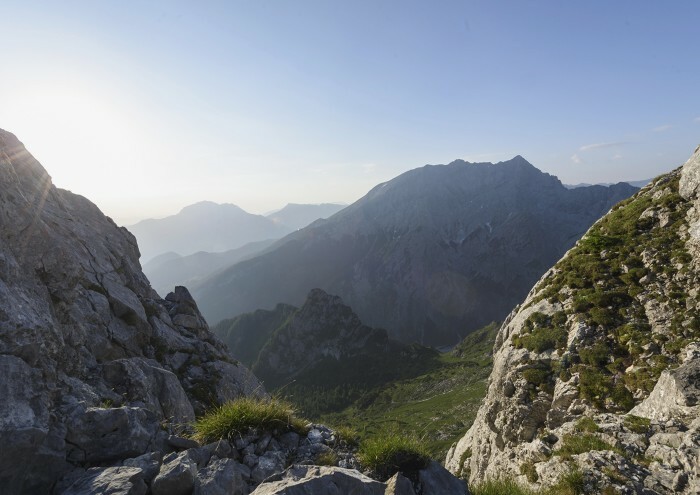 The traverse itself is exposed, which requires experience in mountaineering and rock climbing. At the most difficult parts of the traverse metal cables and iron steps are available for protection. However, the trip should not be confused with a Via Ferrate, as for the most part this protection is not available. 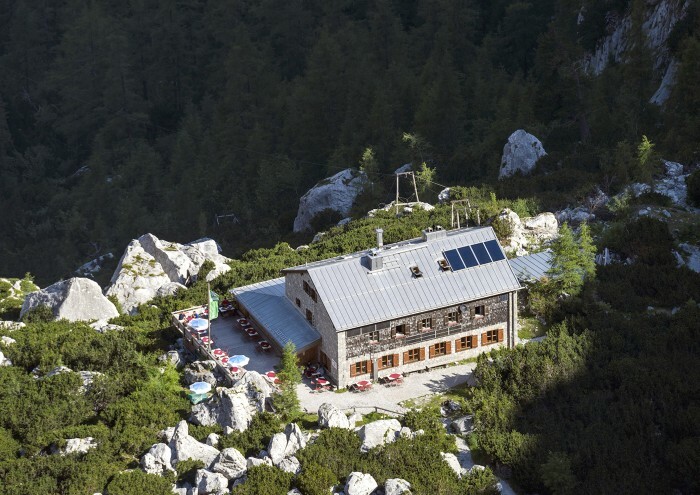 In order to fully enjoy this trip and be on the safe side, spend the night before the trip at the Watzmannhaus. However, it still remains a challenging outing, which should not be underestimated. 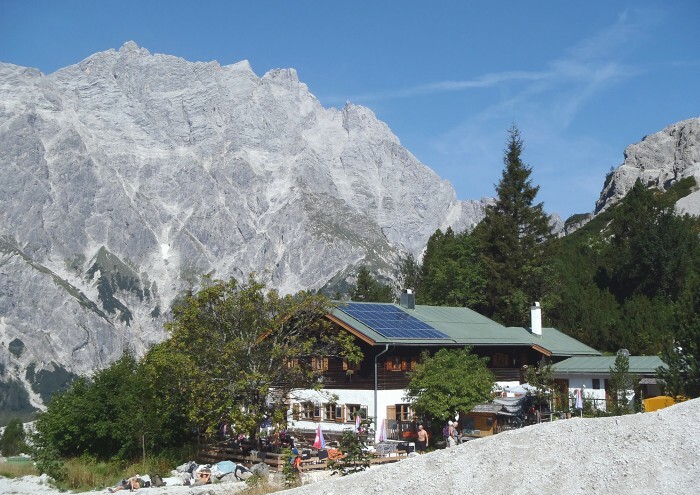 Further information on this trip is available in a broschure of the German Alpine Club, which is available at the Tourist Information in Ramsau or as a download (in German). From the Parking pass the Visitor’s Center of the National Park and follow the asphalt road for about 300 meters. Continue the gravel road to Engertalm and further to Bindalm. From Mai to early October you can also use a shuttle transfer to the Bindalm, the so called AlmErlebnisBus. At the beautiful Bindalm follow Trail Nr. 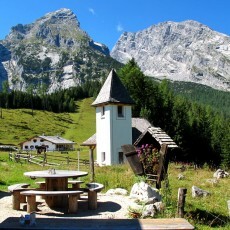 481 via Mittereisalm and Karlkopf (2.195 m) to the Kammerlinghorn. The way back can be done the same way or descent via Karlboden (1.815 m) to the Kammerlingalm and then to Hirschbichl. There the shuttle bus will take you back to the starting point. The only public tansport that takes you into the National Park! 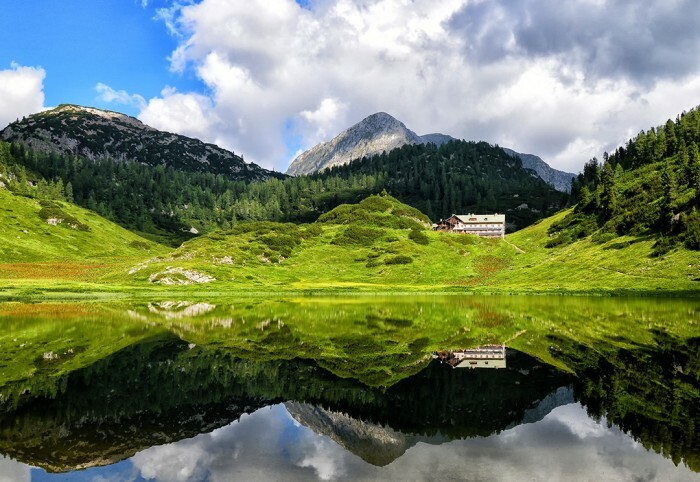 It takes you from the Lake Hintersee through the Klausbach Valley to the Hirschbichl Pass and further to the minicipality of Weißbach bei Lofer – also a Mountaineering Village! From the parking pass the Visitor’s Center of the National Park and follow the asphalt road for about 300 m. Turn right and follow a gravel road to Halsalm/Böslsteig. At the “Halsgrube” turn left, slightly descending. Continueing west, ascent along steep alpine meadows until you reach the foot of rock walls. A path, partially equipped with steel cables, leads you into the cirque “Unteres Wagendrischelkar” and lateron to the Reiter Steinberg. 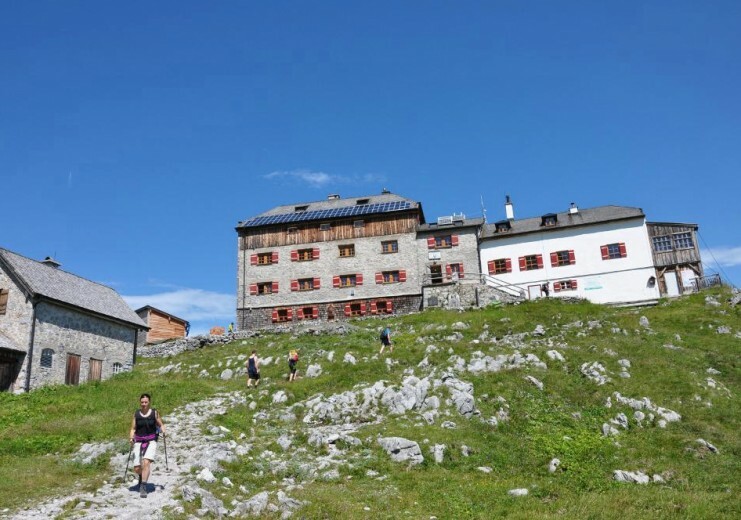 The descent will take you down the “Steinberggasse” and across a beautiful alpine meadow to the alpine hut Neue Traunsteiner Hütte. From the bus stop Engert-Holzstube (AlmErlebnisBus Linie 847) follow the paved road for another 250 m, just before reaching the Engertalm, the “Schaflsteig” starts to the right. Steep hairpin turns lead you through the mountain forest and up on a ridge between the Stadelgraben and Mühsturzgräben. The trail continues along a ridge until finally at 1,800 m you can traverse to the left to the base of the “Stadelmauer”. You pass a little rock tower on your right and reach the start of the little Via Ferrata to the saddle Mayrbergscharte. 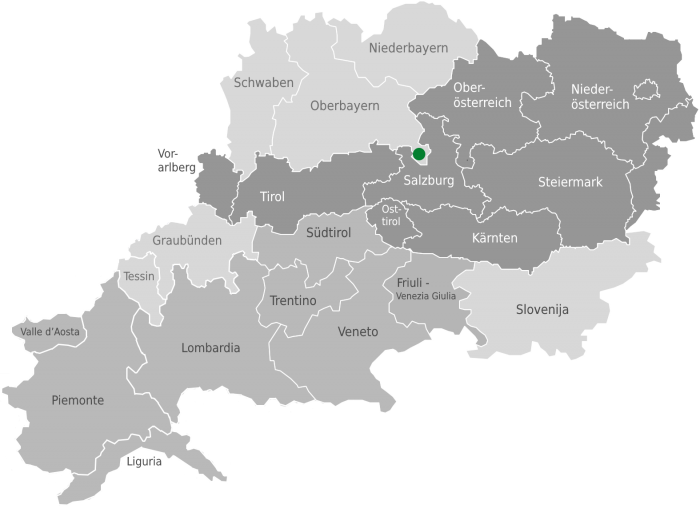 The Maybergscharte, again, is a starting point for various peaks, such as the Wagendrischlhorn and Stadelhorn. 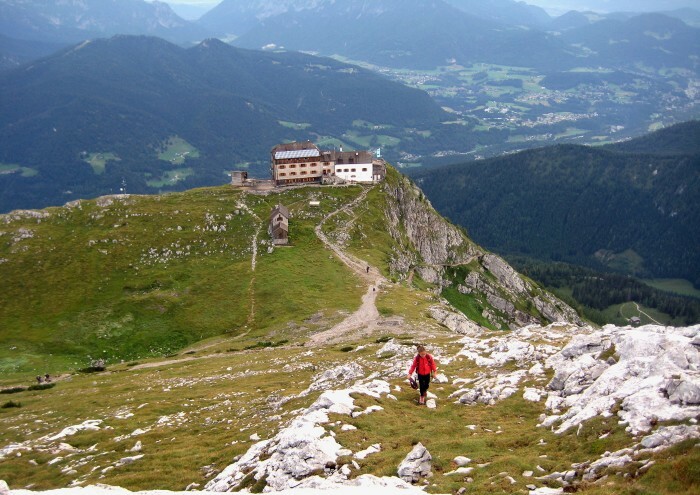 This is a long and alpine outing on one of the most significant peaks of the Berchtesgaden Alps! Our journey starts at the Lake Hintersee from where we ascend straight to the Blaueishütte. From the hut continue towards the dominant large cirque with one of the last bavarian glaciers. Before getting to the glacier a path leads to the right and up a faily steep gully and a slab. Turn left (south) onto the ridge and continue to the so called “Schöner Fleck (2,015 m)” and Rotpalfen. To reach the Hochkalter main peak some easy scrambling is involved. The descent follows the very remote “Ofental”. This descent should not be underestimated, as there is some exposed scambling involved.